A Scandinavian flat bread that is very thin and round. It is made from cooked potatoes, flour, cream, salt, butter and sometimes sugar is added. The potatoes are riced and then the other ingredients, except for the flour, are added. The potato mixture is then refrigerated for several hours to chill the dough. Once the dough is thoroughly chilled, part of the flour is added and the dough is then formed into small balls with just enough additional flour added to make the dough smooth and stiff enough to roll out. The dough is rolled out very thin and then fried on a hot griddle until both sides are lightly browned. The lefse is then removed and place on a towel to cool. Lefse is generally rolled up and served with butter or butter and sugar. 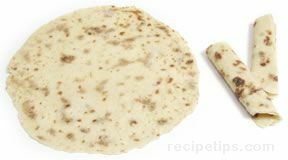 There are many ingredients used on lefse, such as cinnamon, powdered sugar, jelly or luncheon meat and it is sometimes filled with ingredients similar to what you would add to a tortilla.